Each year, a handful of sophomore business minors are selected for the Carey Fellowship, a program created to provide a scholarship and particular internships to a group of hand-selected students. 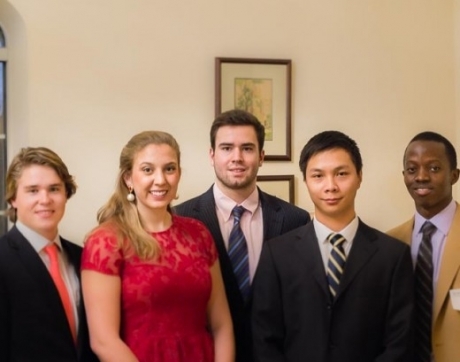 This year, the Babson Center was proud to announce that Hannah Glaw, Halsey Huth, Andrew Moots, Leonce Nshuti, and Shane Xu are recipients of this prestigious award. The Babson Center for Global Commerce offers classes, internships, and programs to Sewanee students interested in business. With a liberal arts approach to preparing business majors and minors, the Babson Center prepares students with skills in critical thinking, communications, and hands-on experience. All five students selected specifically for the Babson Center’s renowned Carey Fellowship program have expressed interest in management, international business, and finance as components of their future careers. The deadline for applications was November of 2013. To some individuals, the Carey Fellow program presented one of the biggest perks of being a Sewanee Tiger. Halsey Huth (C’16) says, “When I was applying to colleges, my dad asked me why I wanted to go to Sewanee. After doing some more research, I found the Carey Fellow program. It was a huge deciding factor for me… so it’s an incredible opportunity that motivated me to come to Sewanee, and it was a pleasant surprise to get it.” With an Economics major and a minor in both Asian Studies and Business, Huth applied with hopes to gain more experience in finance, hopefully in Chicago. He filled out the application, sent in a resumé, and fulfilled the 3.33 GPA eligibility requirement. Despite his preparation, the process was competitive, and only five students were selected in the end. After the determination process, the five Carey Fellows attended a reception to honor their acceptance into a distinctive program that will soon provide fresh internship opportunities. First, they will take a class with Chip Manning over the summer, then consider internship options. Each semester-long internship offered involves another interview process that determines where the Carey Fellows will work and with whom they will work. Sewanee alumni are involved with providing the internships and networking with the sophomores. The five will continue to compete for the chance to work in their first-choice internship, but until then, they will be focusing on their respective majors. Next fall, the application process will restart for sophomores interested in the business minor.